Gabriella Moussette – Franco-Polish Visual Artist, born 1975. My pictorial quest is to achieve the accuracy of the emotions that move me through the vibrations within the colors themselves. I work with varied gesturals, like a dance in front of the canvas, that gives me a rythm to express a colored space. Through this instantaneous and free motion, I look to touch that which moves us, and to interpret through color that which remains imprinted in us, intangible. My quest is to perceive these fleeting, fragile and transient feelings then try to fix them, by playing with their resonance. Since 1995, I have studied multiple techniques over the course of my Art career. From the softness of the earth, sculpting with live models, to the beauty in the power and perennity of bronze in an art foundry where I saw to the fruition of my pieces until the end, to the weightlessness of watercolor pigments, to the carnal contact with pastels and finally to the depths of oil paints and their glazes. I took the time as well to study the diverse techniques of decorative painting, which opened up a vast array of possibilities of mixing the mediums, thus allowing me to have a sentiment of freedom in my work. I also learned the process of engraving and have worked as a graphic artist. Throughout this course of study, painting has always been my guiding thread… and my studies in art therapy (2012-2016) have led me down this path to open myself to a more in-depth understanding of my process of painting. 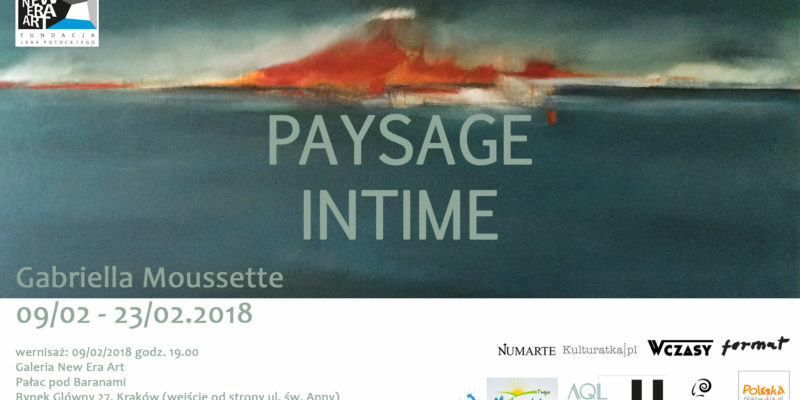 This theme, “Paysage Intime” / „Intimate Landscape”, has really taken shape in 2010 when I was able to put into words my more abstract interrogations. My canvases are a means of evading into dreams, an encounter with our inner landscapes. My work is a form of meditation, an Ode to Nature!